Join 200 voices, including several local choirs for ONE VOICE – a free event at Messums Wiltshire – the gallery and arts centre housed in the famous Tithe Barn on the outskirts of Tisbury. Just bring your voice and best Christmas wishes to fill this atmospheric place! 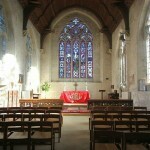 Donations in aid of St John’s Church East Window Appeal. Saturday 22nd December 2018 from 1800 – 2000. The East Window in St John’s Church is in a perilously poor condition and funds are being raised for a brand new replacement.